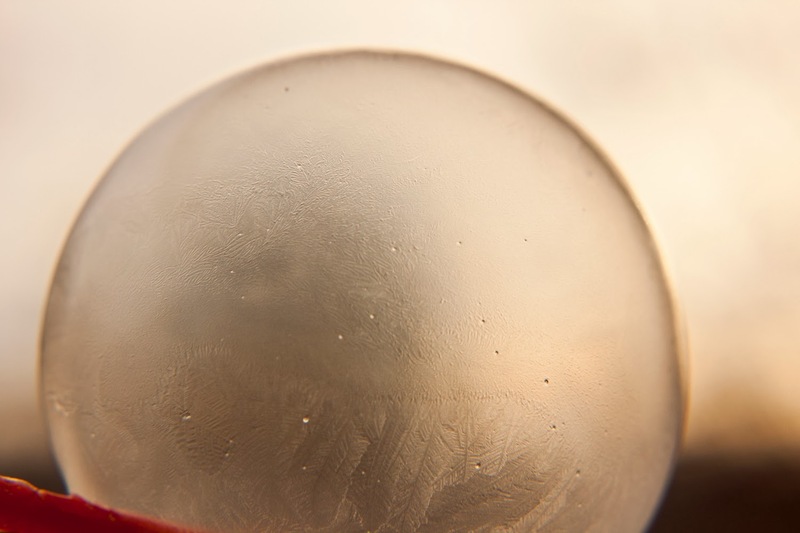 There has been a series of photographs making the rounds of social media sites of frozen bubbles with intricate, frost-like patterns (as seen here: http://www.boredpanda.com/frozen-bubbles-winter-photography-angela-kelly/). Since it has been ridiculously cold here in the Upper Midwest, what better chance to try and see how to replicate such shots. The detailed how to description is below. 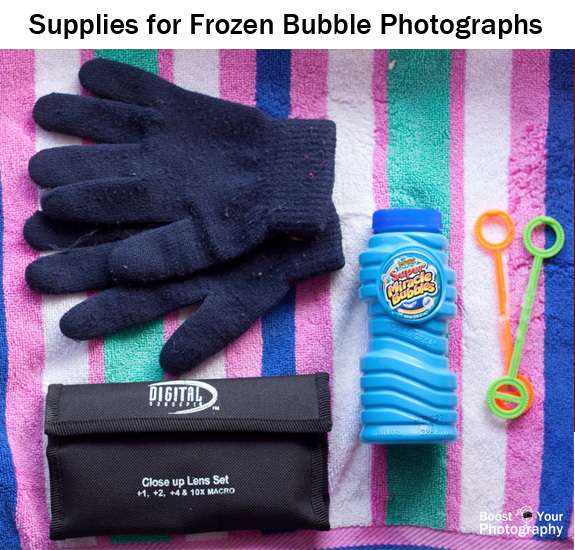 The supplies are fairly basic for creating and photographing bubbles. The main ingredient, of course, is what you are going to use to make the bubbles. I used generic, store-bought bubble solution, while the original photographer used a homemade solution of dish soap, karo syrup, and water. Use what you have. You will also want the capability to take close-up or macro photographs. You can use a dedicated macro lens, like the Canon 100mm macro, if you have it, or you can use inexpensive macro options like close-up lenses (pictured, available online for less than $15USD), which allow you to change the minimum focusing distance of your lens and get closer to your subject. I used a +2 close-up lens on my 50mm f/1.8 lens for all the photographs in this post. Finally, be sure that you are adequately prepared for the weather. Temperatures were right around 0F when I was shooting, so I made sure to double layer my gloves, wearing both the knit pair shown above and a pair of down mittens that could fold back to free my fingers as needed. Be sure you have a warm coat, pants, scarf, hat, etc. Consider trying this technique just outside of a warm house or building so that you can quickly get inside if you get cold or spill bubble solution all over your gloves, etc. 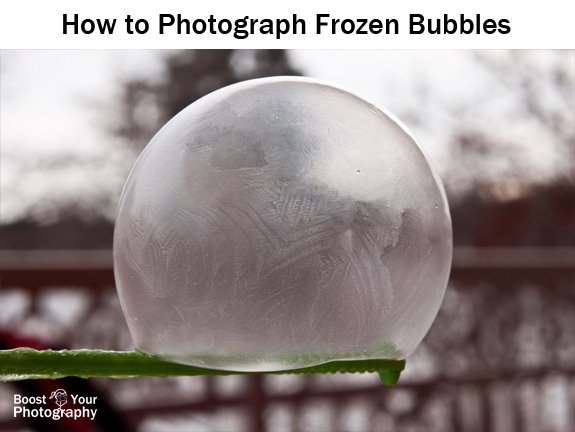 The keys to blowing and then photographing frozen bubbles are patience and a bit of practice. 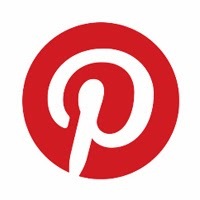 Expect the majority of your bubbles to burst, either immediately after being blown or when they hit the ground. 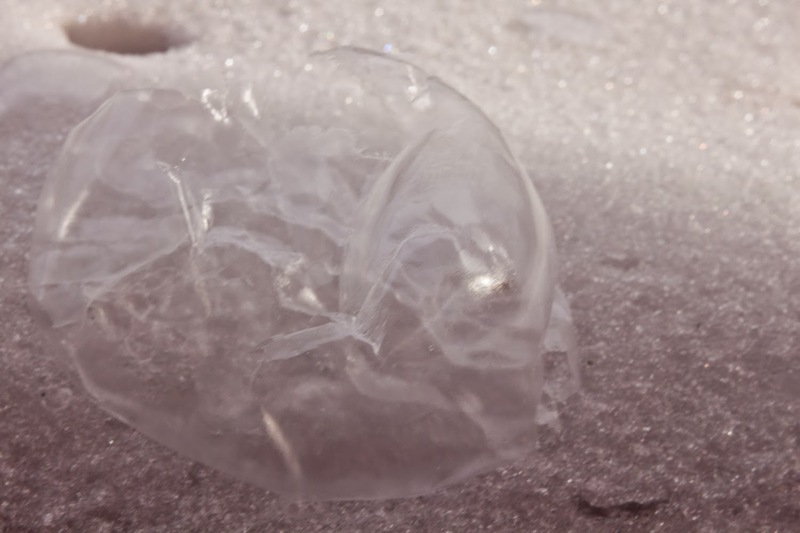 While the bubbles will be freezing at they fall, they are still likely to pop when they impact the ground. You also need to beware of wind. Calm conditions will make it much easier for you to keep and corral your bubbles. I had the best results with bubbles that I was able to 'recapture' on the bubble blowing wand. This allowed them the time to slowly freeze over and also gave me the option to move them around to get a better background for photographing. Even at below zero temperatures, it took longer than I expected for the bubbles to fully freeze over. Expect to be holding onto them for a full minute or more. Even a burst bubble can be interesting. I highly recommend practicing your bubble blowing, catching, and photographing technique indoors first. For me, I chose to hold the bubble solution in my right hand and to dip and hold the wand with my left. I kept my camera slung diagonally across my chest, with the camera around to the back (to avoid dripping any bubble solution on it). Once I had a bubble successfully caught and freezing, then I could set down the bubble solution, scoop up my camera, and start shooting with my right hand only. For camera settings, I chose to shot in Shutter Priority Mode (Tv on Canon, S on Nikon) with an ISO of 200 and a shutter speed of 1/80th of a second. Depending on the light, this gave me a range of aperture values between around f/14-22. I chose 1/80th of a second since it was fast enough for hand-holding a 50mm lens, and the camera would then pick the largest aperture value possible, allowing for a great depth of field (range of the bubble surface in focus). 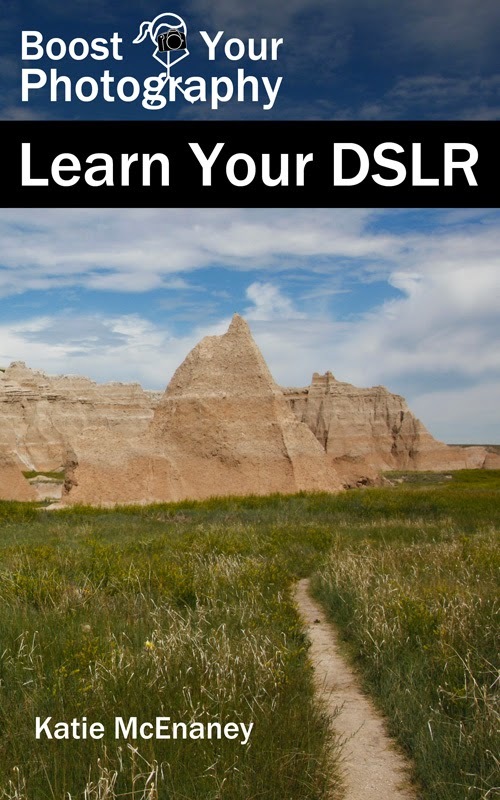 In brighter light, you would be able to choose an even faster shutter. 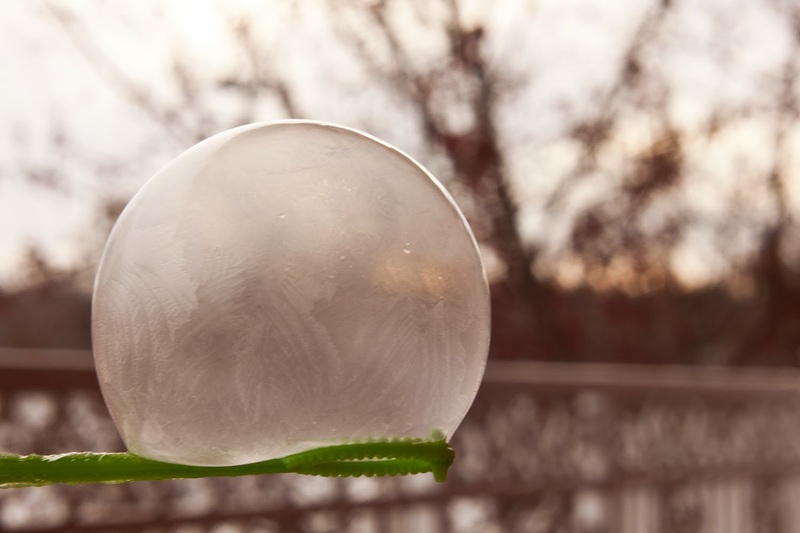 Once you have mastered the techniques, there are endless ways to customize your frozen bubble photographs. Think about choosing your time of day based on the sun, either rising or setting, to get great golden light and hints of sun in your background. 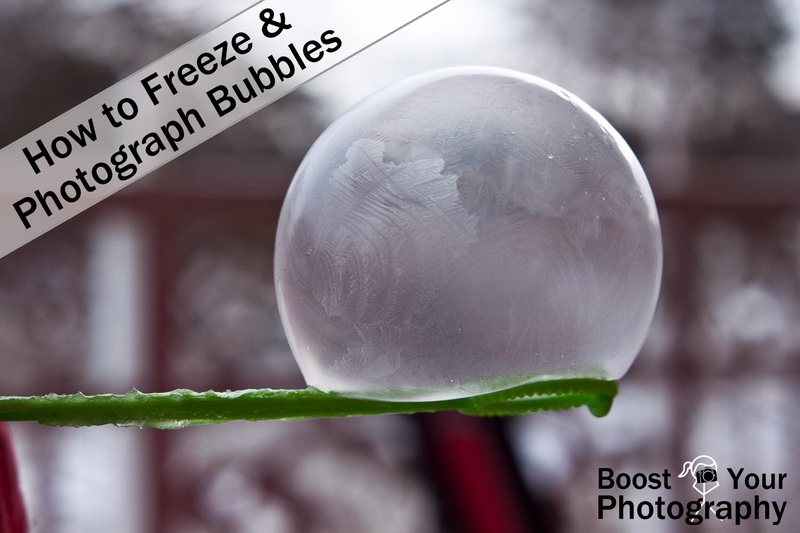 Practice blowing and freezing bubbles and accumulating several to feature in a single image. Or choose a specific detail to feature and focus on. You will be amazed at what you can create!